Set within the Joseon Dynasty period, a messenger attempts to send out a story, but meets fierce resistance by those who want to block him. Filming was originally scheduled to begin December, 2013, but as of mid-January, 2013 production has been delayed by production company JM PICTURES. Reborn Jun 16 2018 11:36 pm What happened to this movie? celestin Apr 04 2015 9:02 am We are already in the fourth month in the year2015 and no further information is being given on this movie,what is going on,is it being cancelled. lissye chen Jul 23 2014 7:52 am I think song seung hoen oppa is the best actor in korea.im waiting your new drama.btw when you will come to indonesia? Lorraine Mar 25 2014 11:15 am Fantastic!! In absolute awe of his acting! He could stand still and I'd watch him. belen Jan 20 2014 7:12 am i like mr.song seung heon. he is a very good actor with devastating smile that can attract anyone. silvia Sep 19 2013 10:05 pm Excelente actor...y está buenísimo!!!!! Kinipela Jun 06 2013 11:22 pm Song Seung- Heon and Shin Se Kyung, are an amazing character in When a man loves. Hopefully as the story was final on Episode 20. Without any doubt Please! Create a Part 2 Episode.. Please! Thanks..
Yoj May 06 2013 11:56 pm Song Seung Heon is one of the Best Top Korean Actors! . Dr. Jin is the first drama I watch opposite Park Min Young and since then watch almost all (maybe 90%) of his drama and movies. Iam watching simultaneously his currently airing drama " When a Man loves" and "East of Eden". I cant put into words how great he portrayed his role as Lee Dong Chul in East of Eden. I haven't even finished it yet but..he's one of the actors who makes me cry. As handsome as he is, he never failed his fans even once in portraying his roles. Awaiting for this new project of his "' The Messenger". Im sure without a double, he will give his best here.. Kudos to Song Seung Heon. For me, you one of the top caliber and versatile actor in Korea. I'm not a Korean but I'm one of your million fans. God Bless SSH. 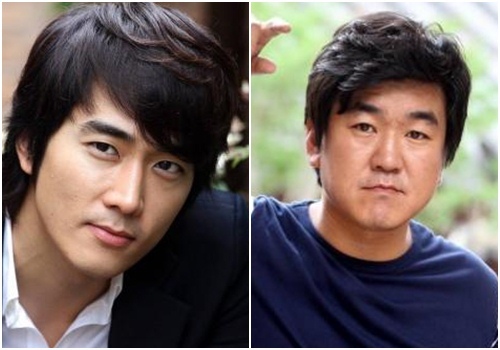 Katherine Oct 28 2012 12:33 am Song Seung Heon is the best Korean actor and he is always use his energy to showcase in his role of the film. He is very great, smart and he can play any roles and, I have so much of admirers, his acting skills is absolutely excellent. Gladys Oct 06 2012 7:02 pm Song Seung Heon my favorite Korean actor you are the best!